With portability at the heart of the BlackBerry PlayBook it’s easy to forget that the device we hold today isn’t connected 24/7. So staying up-to-date with articles here on CrackBerry and other news sites may be a little difficult while on the go. Surely there has to be a fix while we wait for the notorious 4G LTE PlayBook we’ve heard so much about, and well, there is. ReadOnTouch Pro has officially made its way into BlackBerry App World. ReadOnTouch Pro allows you to save sites on your desktop for later viewing on the PlayBook, which is insanely handy. 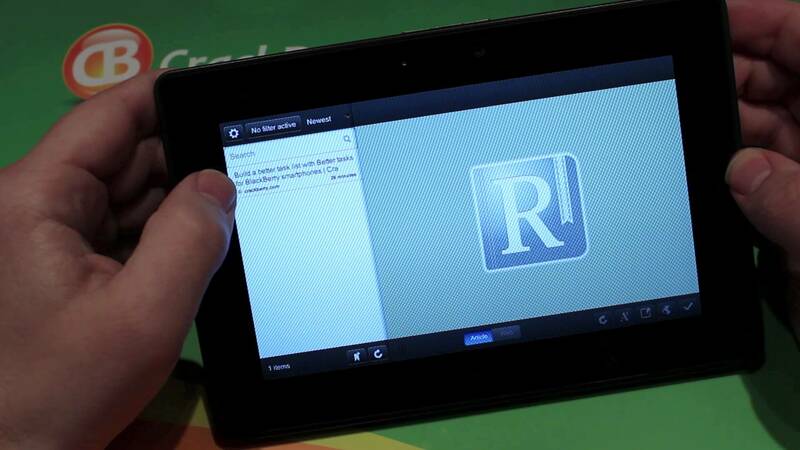 Continue reading for the full review of ReadOnTouch Pro. ReadOnTouch Pro allows you to use the Pocket service (formally known as Read It Later) to “save” webpages and articles for later viewing on the PlayBook, making everything quite seamless. While you’re reading webpages like CrackBerry on your computer all you do is click on the bookmarked link for Read It Later and it gets pushed down to your tablet so you can read it while on a train, plane or automobile. 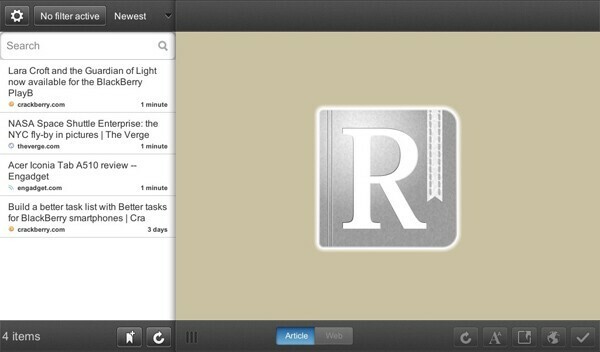 Sven Ziegler, the developer of ReadOnTouch Pro, has thought a lot about the look and feel if the application. While keeping it simple he has been able to offer some of the essential features without all the bloatware bogging it down. The dev has also given the user a few options to customize their in-app experience and features like the ability to change the background color goes a long way while trying to read in the dark. The developer has also added the ability to change the font size, line spacing, and font type, all which should enhance the reading experience. While I did state a lot of the in-app options within the UI section of this review I wanted to go into a little more detail on a few others. While the app has the ability to change the font, line spacing, font type and reader theme, it also has the ability to bookmark articles you're reading. A bookmarking feature may seem a little boring for some, but if you’re saving a lot of articles to read on a long commute it’ll definitely come in handy. There are also options to open the article's original web page (mind that a data connection is required) or view the website within the application without going into the PlayBook's browser. Within the app's settings screen you have a few things you can change that effect how the application functions. 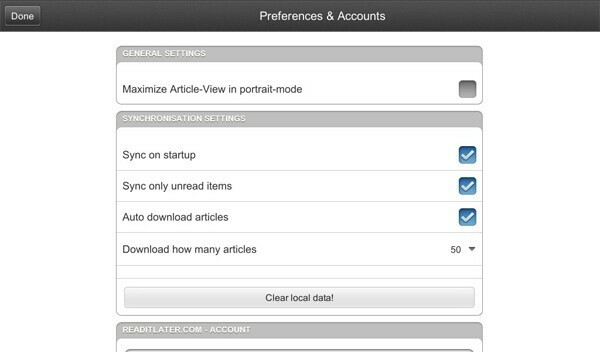 On this page you can enable things like sync on startup, sync only unread articles, and auto download articles. I recommend having all these options enabled, as they’ll provide you with the best experience when using ReadOnTouch Pro. Getting the app up and running while easy, does take a little bit of work from you, the end user. First you’ll need to head over to GetPocket.com and sign up for an account, and follow their instructions on adding the service as a bookmark. Your next step is going into the settings page on ReadOnTouch Pro and entering in your GetPocket.com username and password. After you’ve followed these two simple steps you are able to, well, read it later. ReadOnTouch Pro features a simple, easy-to-navigate user interface along with enough options to customize the in-app experience to your liking. Also worth noting is how simple and painless it is to sync your articles saved on the computer (works on both Mac and PC) as it really extends the functionality of the BlackBerry PlayBook. I found that because the articles within the application are missing the images it really takes away from the whole context of that saved post. More often than not an author will use an image to increase the article's ability to tell a story. Due to a limitation in the GetPocket.com service the application is not able to display any images. 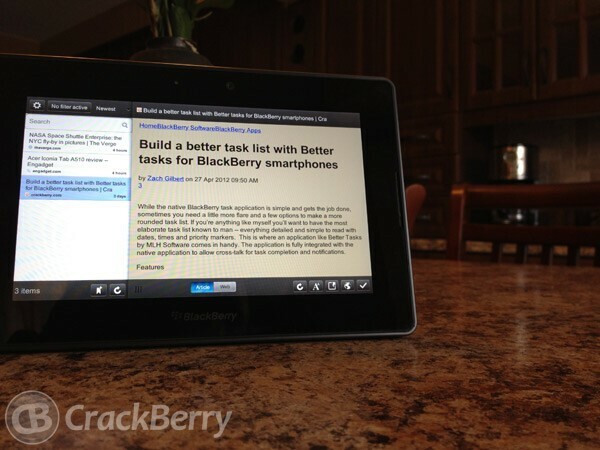 ReadOnTouch Pro is a fantastic addition to the BlackBerry PlayBook. The application really extends the portability factor of the PlayBook and gives BlackBerry and non-BlackBerry users the ability to view content while not connected to the Internet. ReadOnTouch Pro is available in BlackBerry App World for $1.99. But enough reading what I have to say, experience it for yourself and discuss it in the CrackBerry forums.